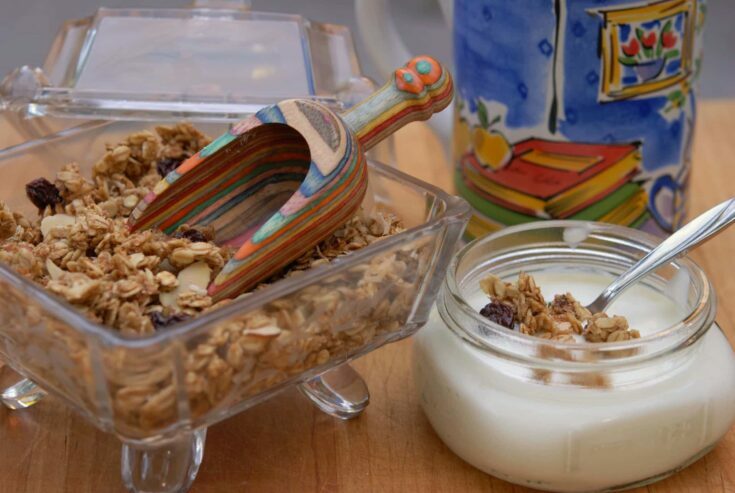 Skinny Homemade Granola is a tasty snack or breakfast granola lightened up with sugar-free maple syrup to reduce the calories, but not the flavor. Makes a perfect topping for my homemade yogurt. Granola is like an oatmeal cookie–in more ways than one. Both are delicious, contain heart-healthy oatmeal, lots of sugar and fat and should be eaten in small quantities only. My favorite way to enjoy this special treat is one tablespoon at a time in my daily jar of yogurt. Preheat oven to 275 degrees. Spray a 13-by-9-inch pan with cooking spray or use a silicone baking mat. 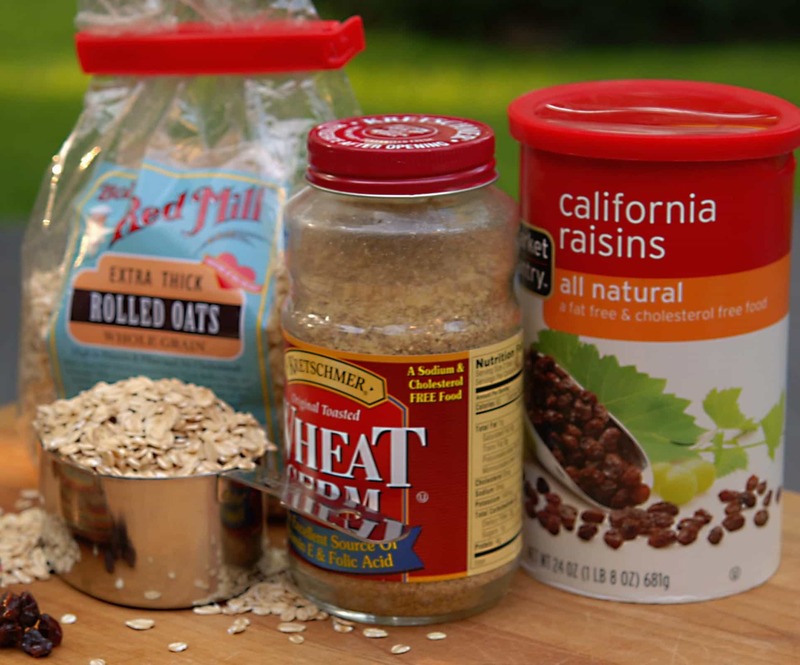 Mix oats, wheat germ, cinnamon and salt. Heat syrup, oil, and water in the microwave to a simmer. Drizzle over oat mixture and stir to combine. Pour mixture into prepared pan. Working a handful at a time, squeeze cereal to form small clumps. Bake for 30 minutes. Stir in raisins, coconut and almonds. Continue to bake until golden brown, 20 to 25 minutes longer. Let cool and store in air-tight container. Vacuum-packing in a quart jar is even better. Thanks so much for sharing your recipies, hope you publish more healthy ones! I did not have any wheat germ so I substituted unprocesed wheat bran (millers bran) instead. Turned out great! Thank you for all your great recipe ideas on here, Paula! shoot! i forgot to bring you the wooden bowls! the pictures you took look great, though. you are very creative!